6 cups of blended toasted corn and wheat cereal, pretzels, mini cheese crackers, nuts and rye crisps. Melt butter in bowl and whisk in oil Worcestershire sauce and soy sauce. Combine Mac Yourself™ cheddar cheese powder, garlic and onion powder. 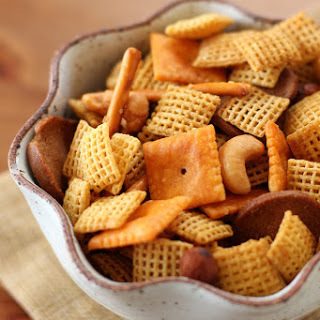 Pour toasted corn, wheat cereal, pretzels and crackers into large sealable bag. Whisk oil and bitter again and pour about 1/4 of it into bag. Seal bag and shake. Repeat with remaining butter mix until well coated. Pour mix out of bag onto large baking sheet. Bake for 6 min or until mix is crisp but not brown. Stir half way through baking. Cool mix for a couple minutes and pour into another sealable bag. Spoon 1/4 of powder mix into bag. Seal and shake. Repeat until all seasoning is gone. Pour contents of bag into searing bowl and munch away!